An iron Iron Age, Roman or early medieval spearhead (c. 500 BC - AD c. 1000). The spearhead has a conical socket. At the apex the socket becomes a long midrib running the entire length of the blade. The blade is broadly kite-shaped. From the socket the first quarter of the blade expands with straight edges. It then tapers gradually with concave edges for the next two quarters of its length. It then tapers more abruptly with straight edges for the last quarter of its length to the tip. Overall, it measures 282 mm long, 49.1 mm wide and 25.3 mm thick. The socket has an external diameter of 25.3 mm and an internal diameter of 19.0 mm. The spearhead weighs 248.1 g.
The spearhead is similar to an example in the British Museum's collection (BM 1856,0719.2) from the Thames, thought to be either Iron Age or early medieval in date. 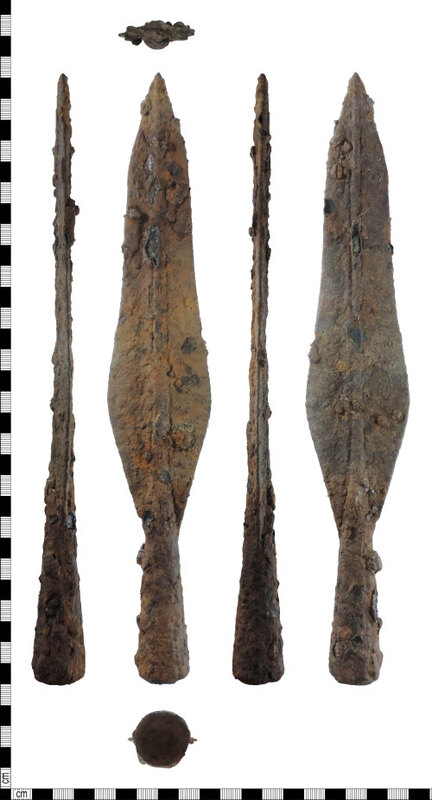 Dr Julia Farley (Curator, European Iron Age Collections at the British Museum) says that spearheads from the Iron Age are normally more curvy, but this does not preclude this example from being of that date. Dr Eleanor Ghey (Curator of Iron Age and Roman Republican Coinage at the British Museum) says that Roman spears are normally less curvy, especially in the middle of the blade, and the sockets are longer, although they can vary. She suggests a Roman Republican date or a very late Roman date. Dr Sue Brunning (Curator, European Early Medieval & Sutton Hoo Collections at the British Museum) says "typical Anglo-Saxon spearheads are almond- or lozenge-shaped in blade cross-section, with some odd zig-zag ones. Some midribbed spears have been found in Anglo-Saxon contexts and are classified by Swanton (1973) as Type B2." Swanton thinks these are early and compares them to ones found in Nydam in Denmark, but there are issues with spearhead typology and Swanton's typology is out of date. However, midribbed spearheads are omitted from Bayliss and Hines (2013) burial chronology. This suggests an early date for the spearhead. Dr Brunning therefore points to a possible 4th to 5th century transitional date for this example. In conclusion, it is currently not possible to date this spearhead to a specific period, although a 4th to 5th century date is possibly more likely.